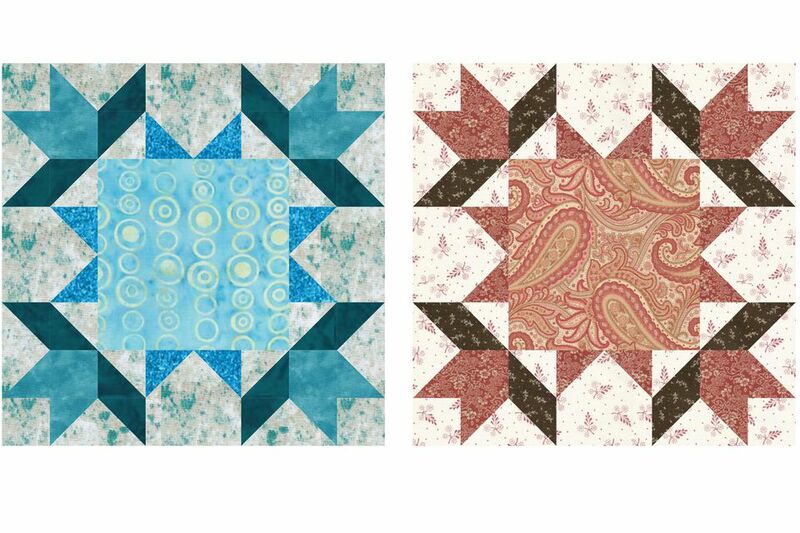 The Sixteen Points Frame star quilt block pattern can be assembled using a controlled color scheme or with your leftover fabrics to make a scrap quilt. If you look closely at the quilt block you'll see that the design can be created using lots of flying geese units, some in a chevron configuration like the pattern for the Morning Star quilt block and others that look more like traditional flying geese. We'll use a combination of quick-pieced patchwork methods to sew the star quilt block. Read the entire quilt block pattern before you cut fabric and begin to sew. Sixteen Point Frame finishes at 12" x 12", perfect for quilt block exchanges and many sampler quilt layouts. The colors mentioned in cutting instructions refer to the quilt block on the left. Scratch out our selections and insert your own color choices. A medium to large scale fabric works nicely for the center of the quilt block. Shown as a splotchy ivory, gray, and blue fabric. Shown as a somewhat subdued blue. Shown as a dark blue-teal. Plain squares that are required aren't illustrated in the upper groups of patchwork. Both types the half square triangle units (HST) shown are made using the Magic 8 assembly method. Alter cutting instructions to sew the units another way as long as they finish at 1-1/2" x 1-1/2" (they should measure 2" square after assembly). Use the Magic 8 Half Square Triangle Method to sew a 4-3/4" background square to the corner points square of the same size. After sewing the grid and cutting apart, each of the eight HST units you made should measure 2" x 2". If you sewed with larger squares as recommended, trim each unit back to 2" square now. Repeat, using one background square cut for HST units and a dark square of the same size. Repeat one more time with remaining HST squares. You should have 16 HST units that measure 2" x 2". Draw a diagonal line from one corner to the opposite corner on the reverse side of each 2" square that will touch the center square (as a triangle when complete). Use the easy Snowball block corner method to align and sew two squares to each 3-1/2" x 3-1/2" background square. Small squares are sewn to opposite sides of the larger square as shown in the top right illustration (not to all four corners). Figure 1. Arrange two corner HST units, one 2" x 2" square of the same blue, and one 2" x 2" background square into two rows as shown. Sew components of each row together. Secure patchwork with straight pins as necessary to keep seam intersections aligned. Press seam allowances towards the plain squares. Join the rows and press. The corner unit should measure 3-1/2" x 3-1/2". Make three more corner units. The units in Figure 2 and Figure 3 are both made from two light/dark HST units, but they are mirror images of each other. Align two light/dark HST units as shown in Figure 2 and sew. Press seam allowance towards the bottom unit. The sewn pair should measure 2" x 3-1/2". Repeat to make three more identical units. Make four more light/dark units, Figure 3, positioning angles as shown and pressing seams towards the bottom unit. Arrange all patchwork into three rows as shown. Sew the components of each row together. Press seam allowances in the top ​and bottom rows towards the corners. Press seam allowances in middle row towards the center. Join the rows and press. The quilt block should measure 12-1/2" x 12-1/2".